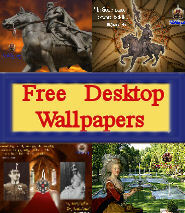 The Tudors endeavored by war to force on her a match with Edward VI of England. Mary, however, was sent to France, 7 August, 1548, where she was excellently educated, as is now admitted by both friend and foe. 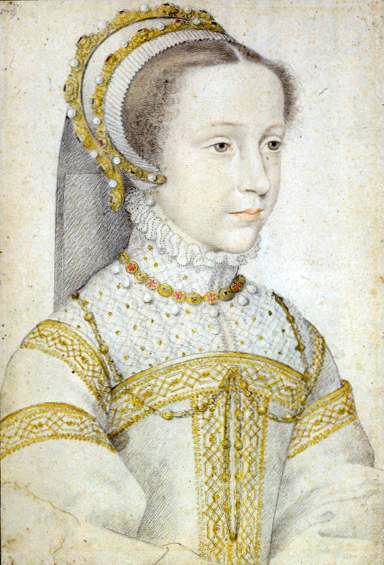 On 24 April, 1558, she married the dauphin Francis and, on the death of Henri II, 10 July, 1559, became Queen Consort of France. This apparent good fortune was saddened by the loss of Scotland. Immediately after the accession of Elizabeth, her council made plans to “help the divisions” of Scotland by aiding those “inclined to true religion”. The revolution broke out in May, and with Elizabeth’s aid soon gained the upper hand. 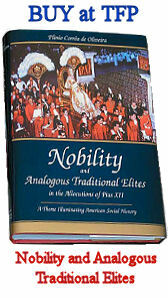 There were dynastic, as well as religious, reasons for this policy. Elizabeth’s birth being illegitimate, Mary, though excluded by the will of Henry VIII, might claim the English Throne as the legitimate heir. As the state of war still prevailed between the two countries, there was no chance of her being accepted, but her heralds did, later on, emblazon England in her arms, which deeply offended the English Queen. Mary’s troubles were still further increased by the Huguenot rising in France, called le tumulte d’Amboise (6-17 March, 1560), making it impossible for the French to succor Mary’s side in Scotland. At last the starving French garrison of Leith was obliged to yield to a large English force, and Mary’s representatives signed the Treaty of Edinburgh (6 July, 1560). One clause of this treaty might have excluded from the English throne all Mary’s descendants, amongst them the present reigning house, which claims through her. Mary would never confirm this treaty. Francis II died, 5 December, and Mary, prostrate for a time with grief, awoke to find all power gone and rivals installed in her place. Though the Scottish reformers had at first openly plotted her deposition, a change was making itself felt, and her return was agreed to. 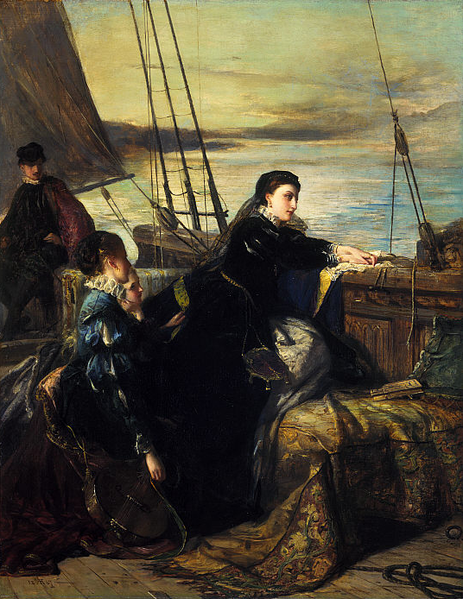 Elizabeth refused a passport, and ordered her fleet to watch for Mary’s vessel. 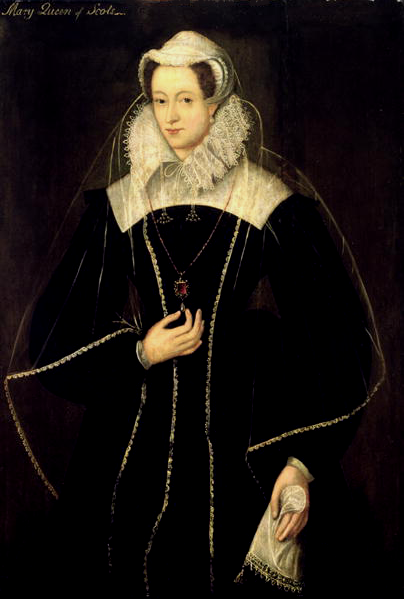 She sailed in apprehension of the worst, but reached Leith in safety, 19 August, 1561. The political revolution, the vast appropriations of church property, and the frenzied hatred of Knox’s followers for Catholicism made any restoration of the old order impossible. Mary contented herself with the new and, by her moderation and management, left time for a gradual return of loyalty. But though she ruled, she did not yet govern. She issued, and frequently repeated, a proclamation accepting religion as she had found it — the first edict of toleration in Great Britain. A slow but steady amelioration of the lot of Catholics took place. At the end of her reign there were no fewer than 12,600 Easter communions at Edinburgh. In 1562 Father Nicholas de Gouda visited her from Pope Pius IV, not without danger to his life. He reported himself sadly disappointed in the Scottish bishops, but was almost enthusiastic for the “devout young queen”, who “numbers scarce twenty summers” and “is without a single protector or good counselor”. Though she still counteracts the machinations of the heretics to the best of her power . . . there is no mistaking the imminent danger of her position”. That was true. Mary was a woman who leaned on her advisers with full and wife-like confidence. But, living as she did amongst false friends, she became an utterly bad judge of male advisers. All her misfortunes may be traced to her mistaking flashy attractions for solid worth. Other sovereigns have indeed made favorites of objectionable persons, but few or none have risked or sacrificed everything for them, as Mary did, again and again. 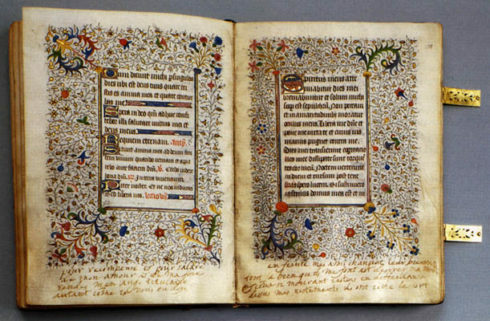 Mary Stuart’s personal breviary, which she took with her to the scaffold, is preserved in the Russian National Library of St. Petersburg. Inscriptions by her hand may be seen on the margins. 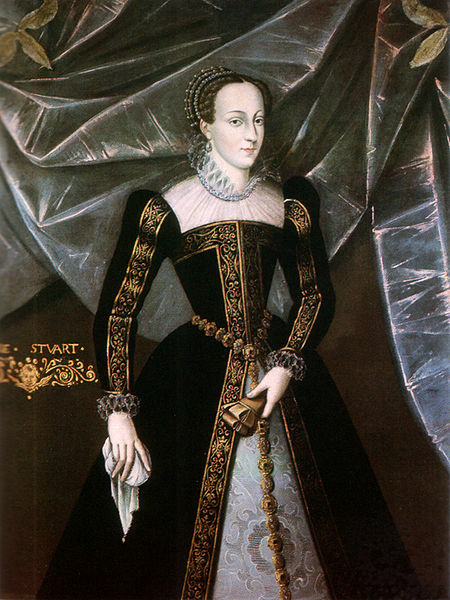 Henry Stuart, Lord Darnley, a great-grandson of Henry VII of England, with claims to both English and Scottish crowns, had always been a possible candidate for Mary’s hand, and, as more powerful suitors fell out, his chances improved. He was, moreover, a Catholic, though of an accommodating sort, for he had been brought up at Elizabeth’s court, and she in February, 1565, let him go to Scotland. Mary, at first cool, soon fell violently in love. The Protestant lords rose in arms, and Elizabeth backed up their rebellion, but Mary drove them victoriously from the country and married Darnley before the dispensation required to remove the impediment arising from their being first cousins had arrived from Rome. But she did leave enough time for a dispensation to be granted, and it was eventually conceded in a form that would suffice, if that were necessary, for a sanatio in radice. As soon as the victory had been won, Darnley was found to be changeable, quarrelsome, and, presumably, also vicious. He became violently jealous of David Rizzio, who, so far as we can see, was perfectly innocent and inoffensive, a merry fellow who helped the queen in her foreign correspondence and sometimes amused her with music. Darnley now entered into a band with the same lords who had lately risen in rebellion against him: they were to seize Rizzio in the queen’s presence, put him to death, and obtain the crown matrimonial for Darnley, who would secure a pardon for them, and reward them. The plot succeeded: Rizzio, torn from Mary’s table, was poignarded outside her door (9 March, 1566). 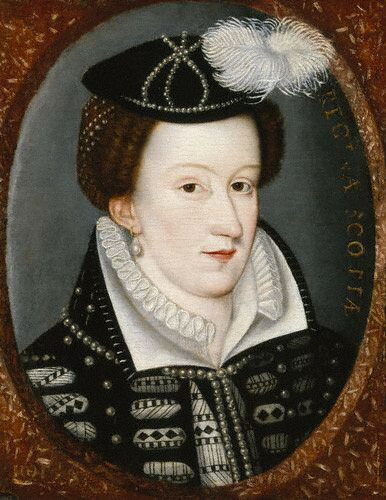 Mary Queen of Scots in an official portrait at the Blairs Museum – The Museum of Scotland’s Catholic Heritage. Mary, though kept a prisoner, managed to escape, and again triumphed over her foes; but respect for her husband was no longer possible. 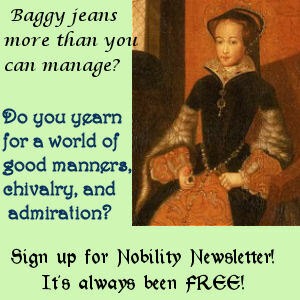 Her favorite was now James Hepburn, Earl of Bothwell, who had served her with courage and fidelity, in the late crisis. Then a band for Darnley’s murder was signed at Ainsley by most of the nobles who had been implicated in the previous plots. Darnley, who had been ill in Glasgow, was brought back to Edinburgh by his wife, and lay that night in her lodgings at Kirk o’ Field. At two the next morning (10 February, 1567) the house was blown up by powder, and the boy (he had only just come of age) was killed. Inquiry into the murder was most perfunctory. Bothwell, who was charged with it, was found not guilty by his peers (12 April), and on the 24th he carried Mary off by force to Dunbar, where she consented to marry him. Bothwell thereupon, with scandalous violence, carried a divorce from his wife through both Protestant and Catholic courts, and married Mary (15 May). Exactly a month later the same lords as before raised forces against their whilom confederate and the queen, whom they met at Carberry Hill. Bothwell was allowed to escape, but Mary who surrendered on the understanding that she should be treated as a queen, was handled with rough violence and immured in Lochleven Castle. The original documents on which a verdict as to her guilt should be formed have perished, and a prolonged controversy has arisen over the evidence still accessible. This confusion, however, is largely due to prepossessions. Of late, with the diminution of Protestant rancor and of enthusiasm for the Stuarts, the conflict of opinions has much diminished. The tendency of modern schools is to regard Mary as a participant, though in a minor and still undetermined degree, in the above-mentioned crimes. The arguments are far too complicated to be given here, but that from authority may be indicated. There were several well-informed representative Catholics at Edinburgh during the critical period. The pope had sent Father Edmund Hay, a Jesuit; Philibert du Croc was there for France, Rubertino Solaro Moretta represented Savoy, while Roche Mamerot, a Dominican, the queen’s confessor, was also there. All these, as also the Spanish ambassador in London, represent the Bothwell match as a disgrace involving a slur on her virtue. Her confessor only defends her from participation in the murder of her husband. The most perfect documentary evidence is that of the so-called “casket letters”, said to have been written by Mary to Bothwell during the fatal crisis. If, on the one hand, their authenticity still lacks final proof, no argument yet brought forward to invalidate them has stood the test of modern criticism. The defeat at Carberry Hill and the imprisonment at Lochleven were blessings in disguise. The Protestant lords avoided a searching inquiry as much as Mary had done; and she alone suffered, while the others went free. This attracted sympathy once more to her cause. She managed to escape, raised an army, but was defeated at Langside (13 May, 1568) and fled into England, where she found herself once more a prisoner. She did not now refuse to justify herself, but made it a condition that she should appear before Elizabeth in person. But Cecil schemed to bring about such a trial as should finally embroil Mary with the king’s lords, as they were now called (for they had crowned the infant James), and so keep the two parties divided, and both dependent on England. This was eventually accomplished in the conferences at York and Westminster before a commission of English peers under the Duke of Norfolk. The casket letters were then produced against Mary, and a thousand filthy charges, afterwards embodied in Buchanan’s “Detectio”. Mary, however, wisely refused to defend herself, unless her dignity as queen was respected. Eventually an open verdict was found. “Nothing has been sufficiently proved, whereby the Queen of England should conceive an evil opinion of her sister” (10 January, 1569). Cecil’s astuteness had overreached itself. Such a verdict from an enemy, was everywhere regarded as one of Not Guilty, and Mary’s reputation, which had everywhere fallen after the Bothwell match, now quickly revived. Her constancy to her faith, which was clearly the chief cause of her sufferings, made a deep impression on all Catholics, and St. Pius V wrote her a letter, which may be regarded as marking her reconciliation with the papacy (9 January, 1570). 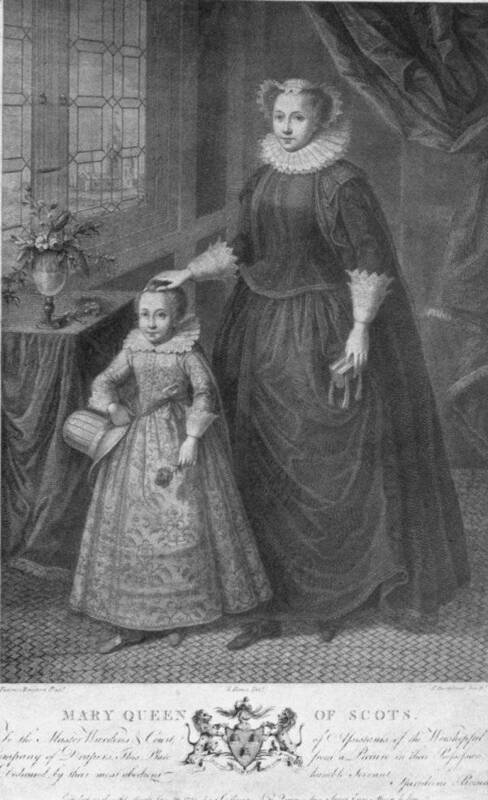 Mary, Queen of Scots, with her son, James VI of Scotland, who succeeded Elizabeth I as James I, beginning Stuart rule. 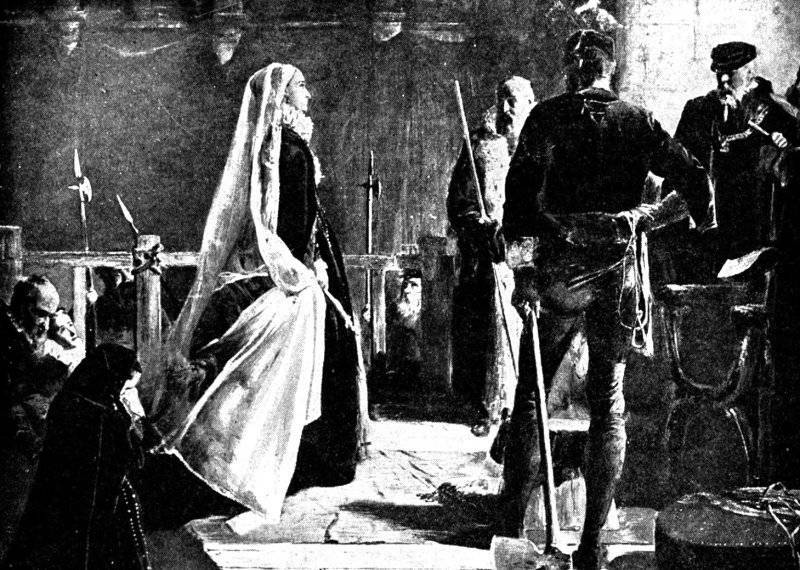 Even before this, a scheme for a declaration of nullity of the marriage with Bothwell, and for a marriage with the Duke of Norfolk, had been suggested and had been supported by what we should now call the Conservative Party among the English peers, a sign that they were not very much impressed by the charges against the Scottish queen, which they had just heard. Norfolk, however, had not the initiative to carry the scheme through. The Catholics in the North rose in his support, but, having no organization, the rising at once collapsed (14 November to 21 December, 1569). Mary had been hurried south by her jailers, with orders to kill her rather than allow her to escape. So slowly did posts travel in those days that the pope, two months after the collapse of the rising, but not having yet heard of its commencement, excommunicated Elizabeth (25 Feb., 1570) in order to pave the way for the appeal to arms. 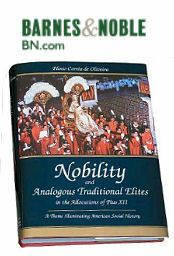 Both the rising and the excommunication were so independent of the main course of affairs that, when the surprise they caused was over, the scheme for the Norfolk marriage resumed its previous course, and an Italian banker, Ridolfi, promised to obtain papal support for it. Lord Acton’s erroneous idea, that Ridolfi was employed by Pius V to obtain Elizabeth’s assassination, seems to have arisen from a mistranslation of Gabutio’s Latin Life of St. Pius in the Bollandists (cf. “Acta SS.”, May, IV, 1680, pp. 657, 658, with Catena, “Vita di Pio V”, Mantua, 1587, p.75). 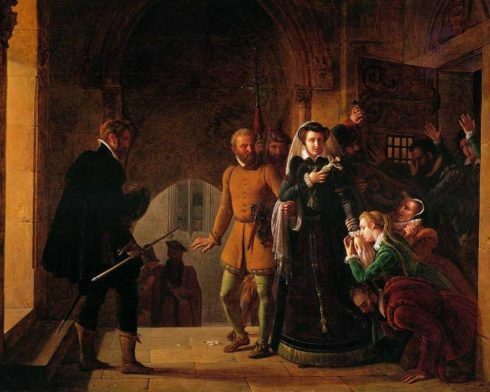 Cecil eventually discovered the intrigue; Norfolk was beheaded, 2 June, 1572, and the Puritans clamored for Mary’s blood, but in this particular Elizabeth would not gratify them. 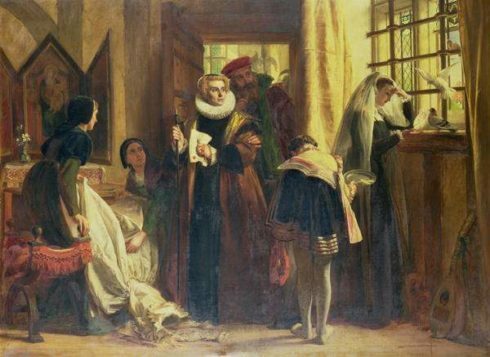 Mary, Queen of Scots, in captivity. Painting by John Callcott Horsley. 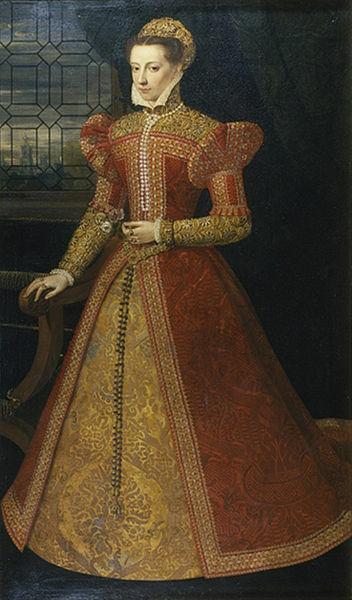 After this, Mary’s imprisonment continued with great rigor for yet fourteen years, under the Earl of Shrewsbury and Sir Amias Paulet, at Sheffield Castle, Tutbury, Wingfield, and Chartley. But she had so many sympathizers that notes were frequently smuggled in, despite all precautions, and Mary’s hopes of eventual release never quite died. The frequent plots of which our Protestant historians so often speak are empty rumors which will not stand historical investigation. Elizabeth’s life was never in danger for a moment. Plans for Mary’s liberation were indeed occasionally formed abroad, but none of them approached within any measurable distance of realization. Her eventual fall was due to her excessive confidence in Thomas Morgan, an agent, who had shown great skill and energy in contriving means of passing in letters, but who was also a vain, quarrelsome, factious man, always ready to talk treason against Elizabeth. Walsingham spies therefore frequently offered to carry letters for him, and eventually the treacherous Gilbert Gifford (a seminarist who afterwards got himself made priest in order to carry on his deceits with less suspicion) contrived a channel of correspondence, in which every letter was sent to or from Mary passed through the hands of Elizabeth’s decipherer Thomas Phellips, and was copied by him. As Morgan was now in communication with Ballard, the only priest, so far as we know, who fell a victim to the temptation to plot against Elizabeth, Mary’s danger was now grave. In due course Ballard, through Anthony Babington, a young gentleman of wealth, wrote, by Gifford’s means, to Mary. It seems that the confederates refused to join the plot unless they had Mary’s approval, and Babington wrote to inquire whether Mary would reward them if they “dispatched the usurper”, and set her free. As Walsingham had two or three agents provocateurs keeping company with the conspirators, the suspicion is vehement that Babington was persuaded to ask this perilous question, but positive proof of this has not yet been found. 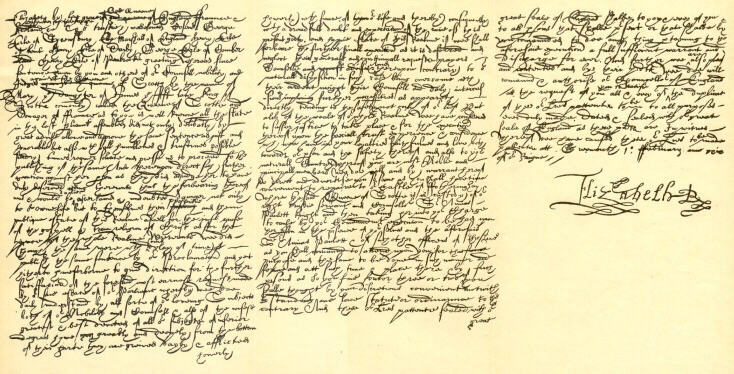 Against the advice of her secretaries, Mary answered this letter, promising to reward those who aided her escape, but saying nothing about the assassination (17 July, 1586). Mary, Queen of Scots is being taken to the place of execution and separated from the faithful followers who had shared her imprisonment. Painting by Pierre Révoil. Babington and his fellows were now arrested, tried and executed, then Mary’s trial began (14 and 15 October). A death sentence was the object desired, and it was of course obtained. Mary freely confessed that she had always sought and always would seek means of escape. As to plots against the life of Elizabeth, she protested “her innocence, and that she had not procured or encouraged any hurt against her Majesty”, which was perfectly true. As to the allegation of bare knowledge of treason without having manifested it, the prosecution would not restrict itself to so moderate a charge. 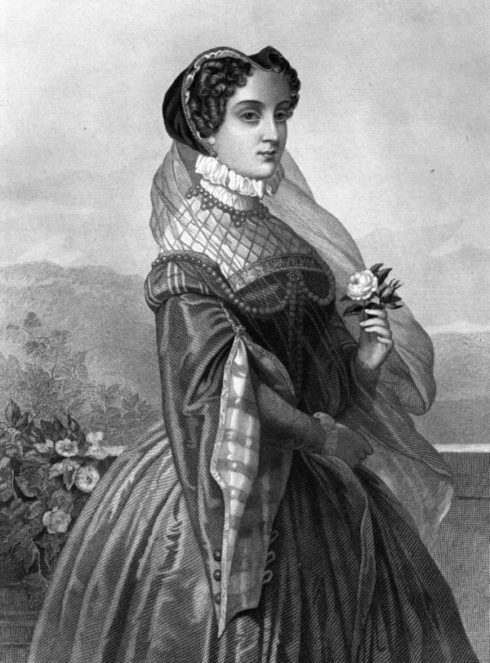 Mary, moreover, always contended that the Queen of Scotland did not incur responsibilities for the plottings of English subjects, even if she had known of them. 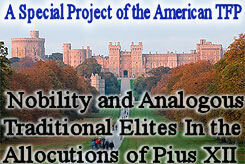 Indeed, in those days of royal privilege, her rank would, in most men’s minds, have excused her in any case. But Lord Burghley, seeing how much turned on this point of privilege, refused her all signs of royalty, and she was condemned as “Mary Stuart, commonly called Queen of Scotland”. During the whole process of her trial and execution, Mary acted with magnificent courage worthy of her noble character and queenly rank. There can be no question that she died with the charity and magnanimity of a martyr; as also that her execution was due, on the part of her enemies, to hatred of the Faith. Pope Benedict XIV gives it as his opinion that on these two heads no requisite seems wanting for a formal declaration of martyrdom, if only the charges connected with the names of Darnley and Bothwell could be entirely eliminated (“Opera omnia”, Prato, 1840, III, c.xiii, s. 10). 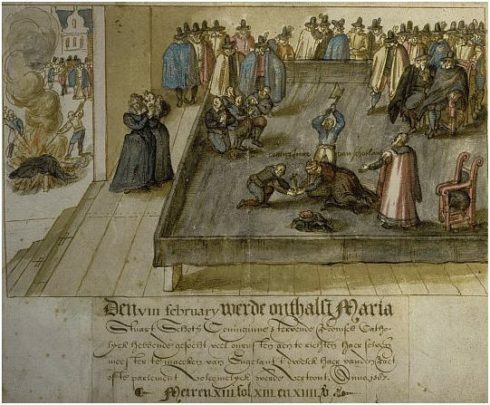 This 1613 watercolor in the National Portrait Gallery of Scotland, of the beheading of Mary, Queen of Scots, was made for a Dutch magistrate. The [watercolor] picture does reflect eye witness accounts of the event. 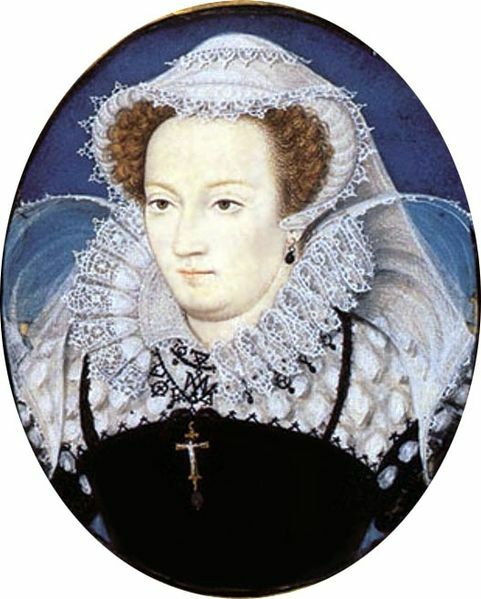 Queen Mary was not beheaded with a single strike. The first blow missed her neck and struck the back of her head. The second blow severed the neck, except for a small bit of sinew, which the executioner cut through using the axe. All of her clothing, the block, and everything touched by her blood were burnt to prevent supporters keeping them as relics. This scene is shown on the far left. At first glance the portraits of Mary appear to be inconsistent with one another and with any handsome original. But modern criticism has reduced genuine portraits to a comparatively small number and shown how they may be reconciled, while their stiff appearance is probably only the result of the unskillful painter’s endeavor to represent the quality of majesty. Three chalk sketches by Clouet (Jeanet), representing her at the ages of 9, 16, and 19, are the most reliable for outline. The third, “Le Deuil Blanc”, has been several times copied in oil or miniature. For her reign in Scotland no picture seems to be known, except, perhaps, Lord Leven and Melville’s, which is interesting as the only one that gives us an idea of life. During her captivity it seems she was painted in miniatures only, and that from these descend the so-called “Sheffield” type of portraits. A very valuable picture was painted after her death, showing the execution; this, now at Blairs, and its copies (at Windsor, etc.) are called “memorial pictures”.